From Whole Foods it costs a whopping $9.99 – though there are just over 8 servings per bag which breaks down to about $1.25 per serving. Not so bad considering that it’s gluten free and packed with protein! Or order directly from Earth’s Supergrains, where a 3lb bag costs $20! I’m hoping to resurrect Monday’s Maven, an every Monday sharing from me about a product I like/love. Here’s my first new Monday’s Maven post! For several years I’ve been starting nearly every day with an egg. I got into this habit when I first had fibromyalgia and my muscle mass was diminishing rapidly. I knew I needed more protein and starting the day with an egg seemed like a good idea as it gave me 6 grams of protein right out of the morning starting gate. But I had concern that this would impact my cholesterol, which has always been nice and low. So, each year I’d make sure to have my cholesterol levels checked. It always stayed the same despite the daily egg. For my digestive health, and by extension my overall health, I eat gluten free. One of my frustrations through the years has been that I couldn’t eat oats, as they are typically grown near wheat fields where wheat dust is carried by the wind and settles on the oats. I have been so happy to see in the past year or two that gluten free oats are suddenly available. Thank you to the farmers who have created oat fields that are isolated from wheat fields. Tasty granolas seemed to be the first form the availability of gluten free oats took. Then plain oatmeal. It’s easy to prepare, tasty good, and best of all – it has zero cholesterol. Not only that, but oats help lower cholesterol. And this porridge contains 8 grams of protein per serving – more than an egg! I make two servings when I cook it, and save the second to be reheated and enjoyed a day or two later. This is one robust breakfast to kickstart my day! 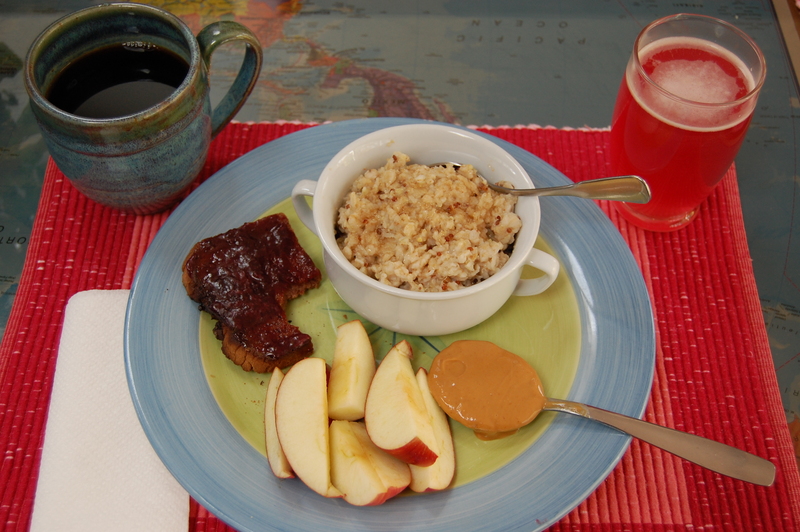 PS I dip the apple slices in the spoonful of peanut butter! More on that another time! 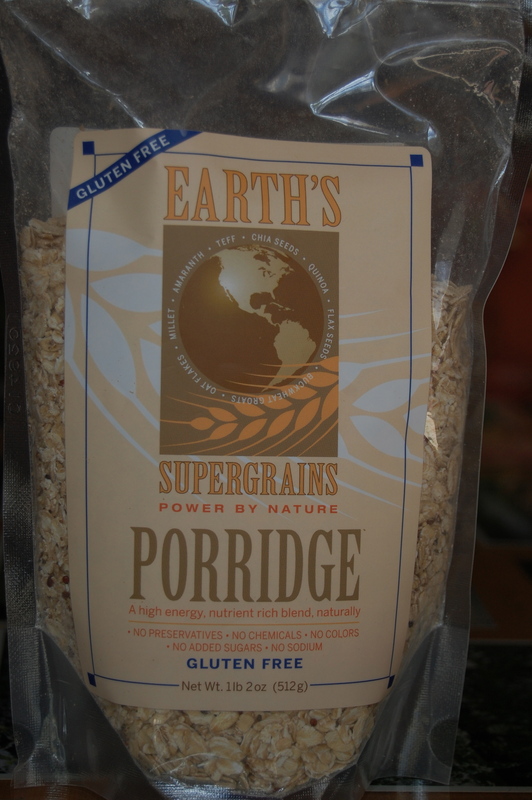 Till then, healthy eating with Earth’s Supergrains Porridge!